Do you often find yourself covering your mouth when you laugh because you're self-conscious about the appearance of your teeth? Have you spent years dreaming of a straighter, more beautiful smile, but don't want to spend even more time in bulky metal wire-and-bracket braces? For adults who want to straighten their teeth without all of the hassle and time that come with traditional orthodontic treatment, Boston Smile Center offers a highly preferable alternative: Six Month Smiles®. The process used to achieve a beautiful smile in six months is simple and straightforward. 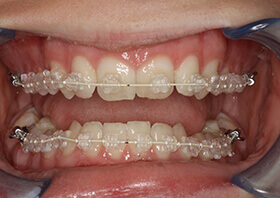 Rather than enduring years of invasive, expensive orthodontic treatment that leaves you hiding your smile for even longer, you'll enjoy accelerated progress that effectively straightens the teeth within your smile zone—all with clear brackets and tooth-colored wires so you can still smile with confidence. As the treatment's name conveys, the majority of patients achieve a stunning, straight new smile within six months. In some cases, optimal results are achieved in even less time. You'll also have fewer office visits and checkups than you would with traditional braces, saving you both valuable time and money. If you're ready to make the first step on a shorter-than-ever journey to a brand new smile, contact us at Boston Smile Center today. We’re delighted to offer this service to patients from the neighborhoods of Brighton, Allston, Fenway, and all nearby areas. With the help of Dr. Sasson and his experienced staff, you'll be happily flashing your brilliant pearly whites in no time. We look forward to welcoming you to our office, conveniently located in Brookline, MA, and showing you how quickly and easily you can attain a beautiful smile with the revolutionary orthodontic treatment, Six Month Smiles®.